This car won the 1995 24 Hr of Le Mans, as we all know, and have all read about ad nauseam, but it’s just such a beast of a car I couldn’t help but pull it out. But instead of doing the same shots, let’s look at two of its distinguishing features, the mighty S70/2 V12 engine, and the night time driving lights that Sn210 has confessed to hating so much but which I adore. The McLaren F1 was always going to have a normally aspirated V12. That was the requirement by Gordon Murray, in order to increase reliability and driver control. However, after approaching Honda about taking a 558 hp engine derived from their McLaren Honda F1 cars and getting a firm “no” on that, Isuzu suggested their 3.5L V12 that they were developing for Lotus F1. But this was not to be, as Murray decided he wanted a brand name engine with proven race pedigree. Gordon Murray then went to BMW, who developed the 6.1L S70/2. The engine was somewhat heavier than what Murray wanted, but I guess you win some and you lose some, since the BMW block did produce 636hp, so quite a bit more than the planned 558. The S70 is basically two 3L S50 inline 6 engines put together with glorious effect, and was later used in the 1998 BMW V12 LM and the 1999 Le Mans-winning V12 LMR, as well as the bonkers X5 LM in 2000. About those lights then, which one could argue directly contributed to the #59 winning the 1995 race by enabling JJ Lehto to turn in some blistering times during his night stint. 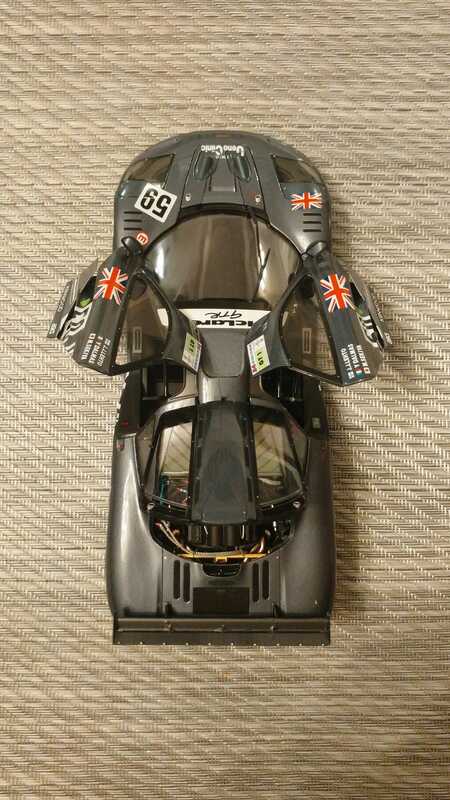 These quirky cross-eyed things were developed after pre-qualifying at the 1995 race, when, according to Barry Lett, the chief designer of the GTR, there was a concern of drivers having trouble seeing the apex of the turns accurately due to the car’s high cheekbones and where the lights were. And since they knew they could run the car more efficiently at night due to lower temperatures, they didn’t want to hinder that increased efficiency with not being able to place the car in the corner perfectly. The idea, then, was to mount the lights on the frunk, but if the lights pointed out toward the apex, the beams would still get cut out by the bodywork. So the obvious solution: cross the beams to light the opposite apex, which cleverly gave the beams just enough room to clear the body and light the apex. The team had a road car in the garage and over the next two days they modeled the lights on the front of that car with clay, molded and made the parts, and fitted them to the #59 car for the race. And the trick clearly worked, because they won the race! The #59 was the only GTR to get those lights fitted, and the TSM model is the only 1:18 I’ve seen that has them, so obviously it was a match made in heaven. Sorry, Sn210, but those lights are dope.